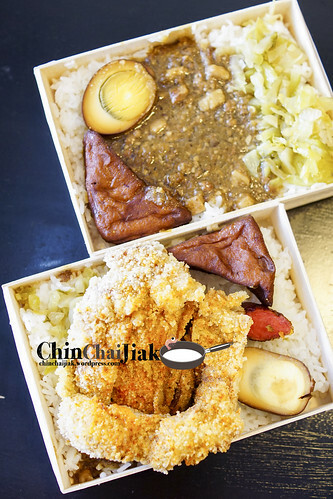 Railway Bento was originated from Taiwan and they currently have two outlets in Singapore. 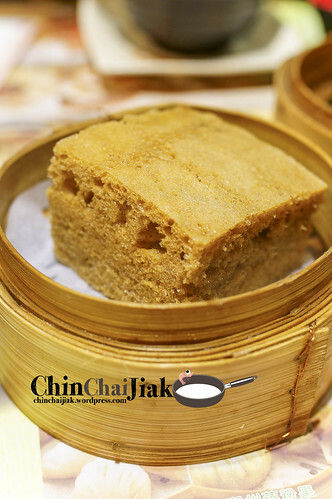 These rice boxes form a great part of Taiwan’s rich food culture and are widely popular in Taiwan till date. In the older days, their people have to travel long distance on train and have to rely on these lunch boxes for their meals. 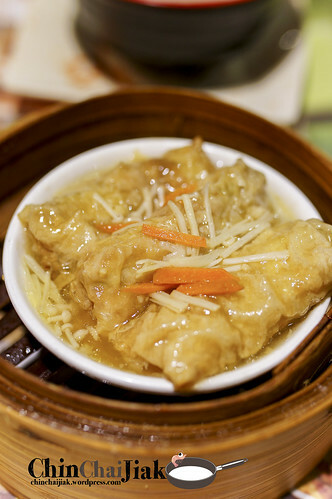 These lunch boxes have a well balanced food spread like meat, vegetable, egg, bean curd and rice. These lunch boxes come in at traditional and pretty looking wooden box packaging and also come in a variety of choices. I visited their branch at the CT Hub with the invitation of Glen, the boss of Railway Bento. Thank you Glen for the kind invitation and for hosting me. 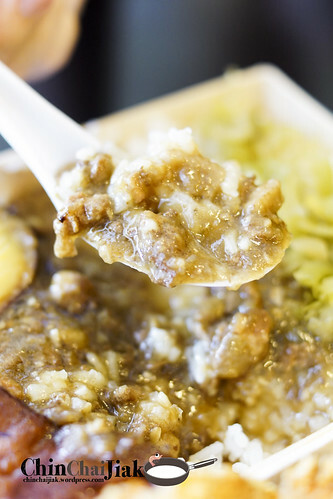 Generally I have two complains on the braised minced pork rice (卤肉饭) that i had in Singapore. Firstly it’s the pricing. 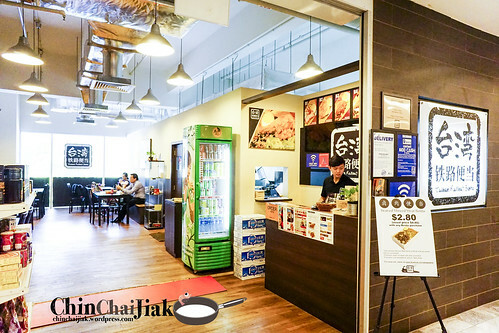 Typically in Taiwan, a good bowl of braised minced pork rice cost something like S$3 to S$4 but in Singapore, it cost about $8 to $12 in a Taiwan-style Cafe. 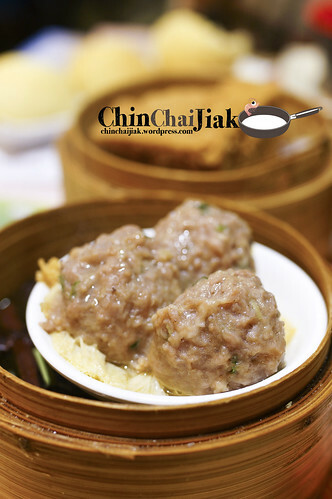 Secondly, I personally prefer the minced meat to be really fine, and well mixed into a thick gravy but many sold them in thicker chunks. 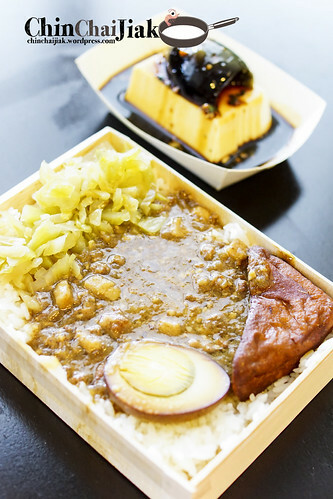 Therefore I thought Railway Bento did well in this two aspects, keeping the price at an affordable $4.80 (even at their Tanjong Pagar branch), and there is a good mix of fatty and leaner meat in the finely-minced meat sauce. I thought braised minced pork rice (卤肉饭) is suppose to be a little greasy to be enjoyable and Railway Bento’s version has just the right amount of it. 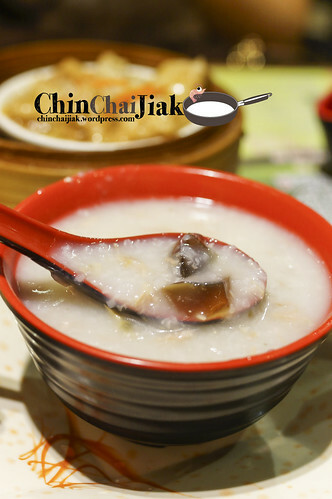 The sauce has a very thick texture that coats the rice perfectly. This meat sauce is actually less salty than it looks which i think it can be readily accepted by Singaporeans. As for their chicken cutlet bento, i thought it’s rather decent. There nothing exactly fantastic about it but also nothing bad about it. It’s freshly fried, crispy and served piping hot. The chicken cutlet taste like those from a typical Taiwan Snack Stall in Singapore. 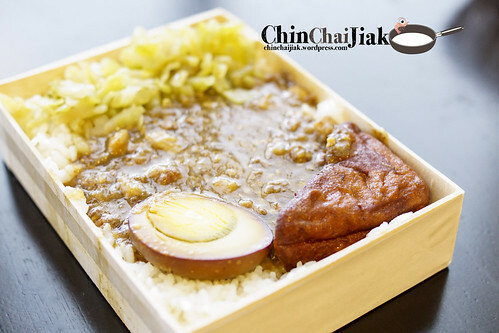 At $6.80, the portion is quite decent for it’s price and this bento also comes with half an egg, salted vegetable, a slice of Taiwan sausage and it also comes with a small portion of braised minced pork. I thought the sauce is very heavy and salty in taste but I like it. This sauce has a complicated mix of chopped coriander, garlic, soy sauce and chilli and is for sure too salty if consume on its own. However I thought it goes pretty well with the cold tofu. 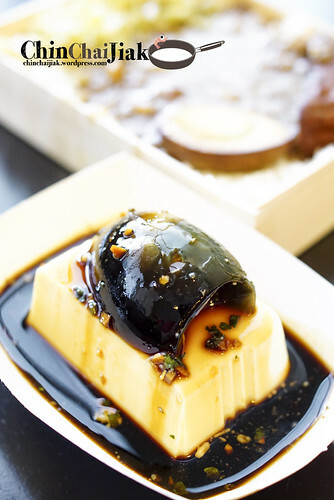 I also like the century egg that comes with a soft yolk center. 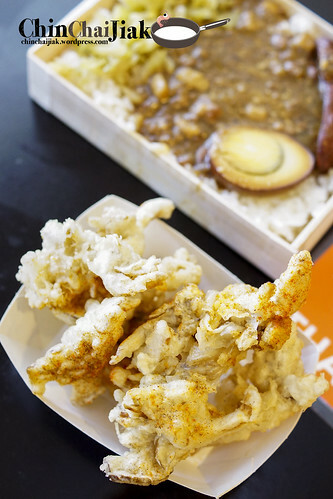 The king oyster mushroom is coated with a tempura-style breading, deep fried to crisp, and sprinkled with chilli powder. 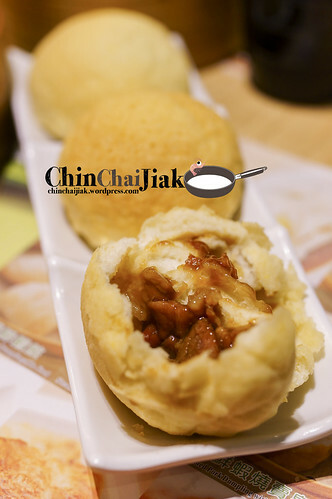 Having this dish is more for the texture than that the taste as this mushroom doesn’t has a very distinctive taste to begin one and it’s more like munching on the breading and texture of the Oyster Mushroom. 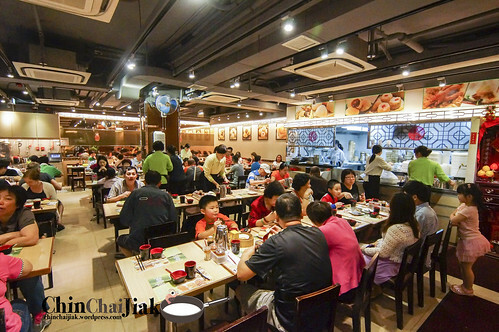 Taiwan cuisine used to be very popular in Singapore but it’s craze had significantly reduced after the cafe culture kicks in. The Railway Bento made a good decision to market it’s food as a eat-and-go model, rather than a Taiwan-style Cafe, therefore keeping the cost low. 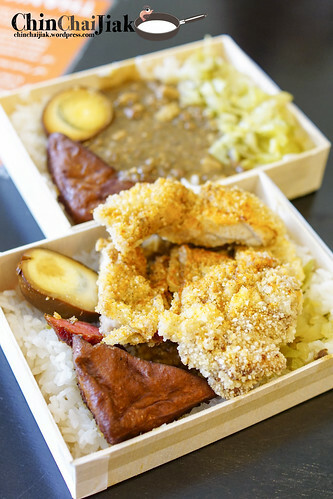 As one of the members of the working class, I thought Railway Bento offers a hassle free lunch takeaway option with a variety of food items in a box. 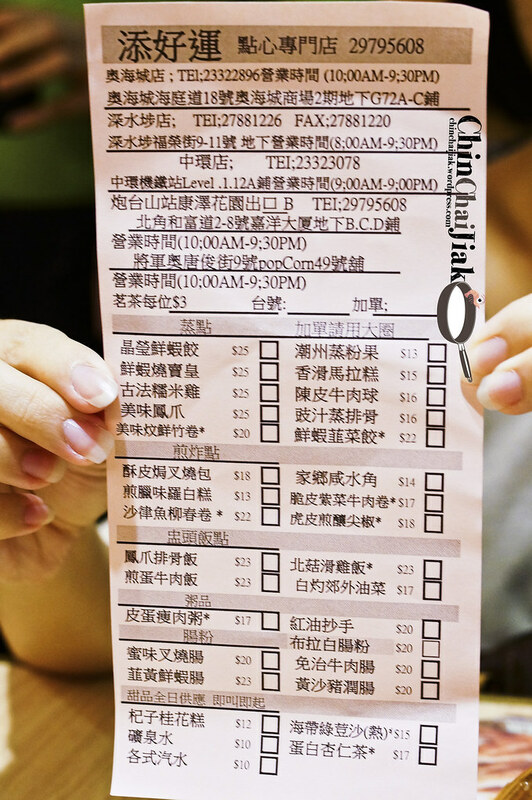 Not only the price is reasonable, it also offer a rather decent food quality and choices. 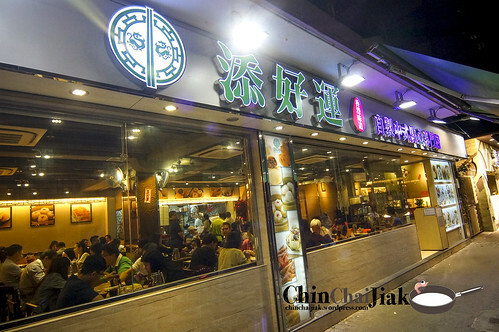 I enjoyed the meal, especially the braised minced pork rice. 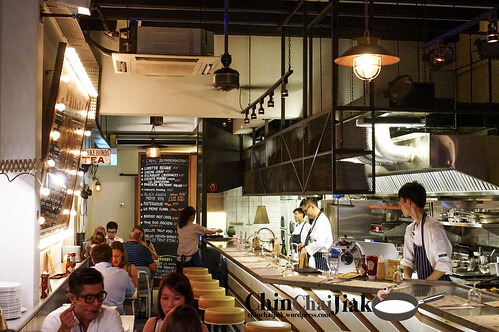 Market grill is a relatively new western grill bar situated along the stretch of shop house along Telok Ayer road that is nearer to Amoy Food Centre. 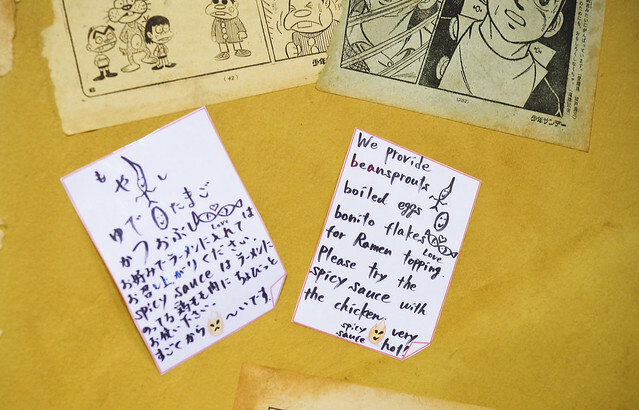 Their menu is extensive considering the floor area of the restaurant. Probably due to the small seating capacity, they do not take in reservation. 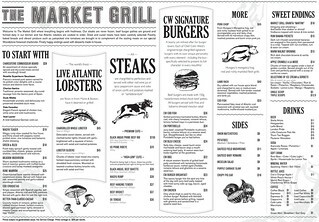 Market Grill is rather well known for their steaks and burgers. For their lower range steak, the choice of cut is interesting that they decided to go with the less well known cut such as the bavette. 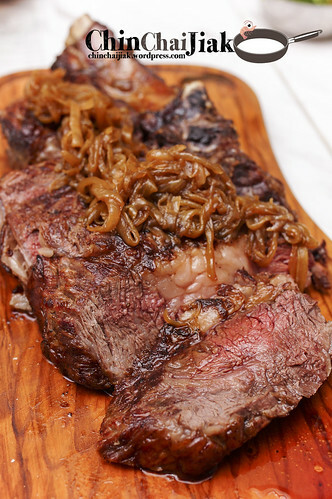 Bavette is a cut somewhere at the stomach of the cow and it’s a french term for flank steak. A flank actually quite commonly used in the Chinese cuisine for “stir-fried beef”. They also offer another cut known as the Wagyu Rump. A beef rump is very different to American and British. To the British, beef rump is actually referring to the Sirloin cut while the American refers rump to the round of the cow, that is the cut at the lower back, near to the hind legs of the cow. I read online that some people said that it’s really tender so i have to guess that it’s a British rump. 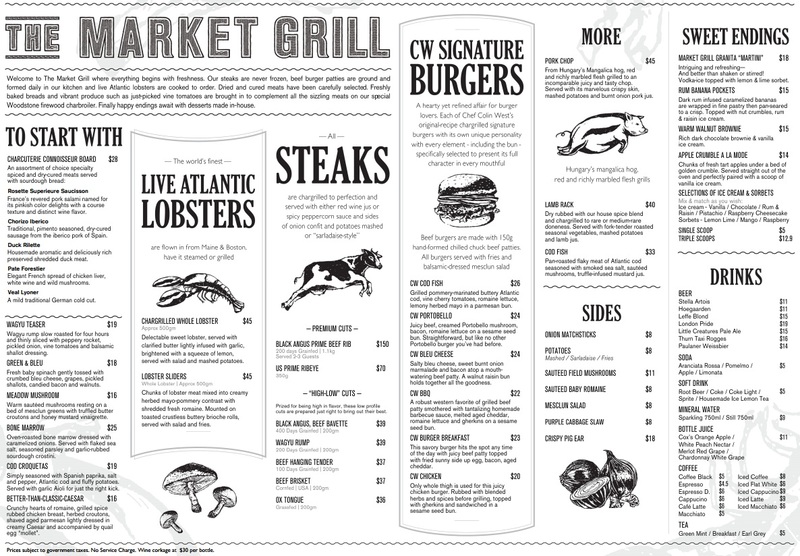 Care to share if you have better knowledge of Market Grill’ rump. 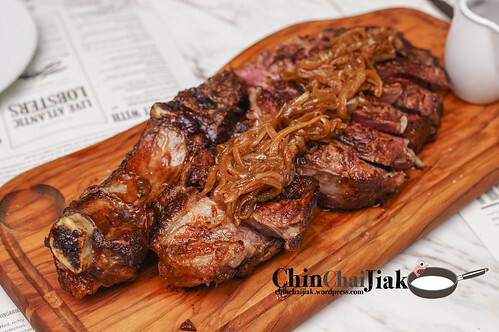 I ordered their 200 days grain-fed Black Angus Prime Rib that cost $150 at 1.10kg. If you read the finer print, this dish is actually good for sharing for up to three pax (which i did). 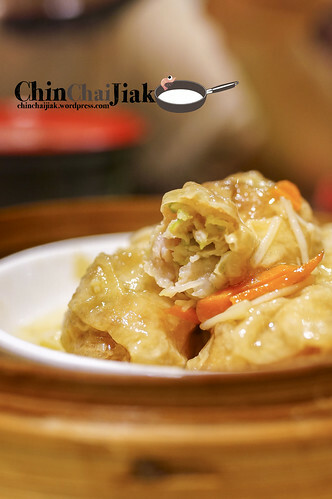 A 45 minutes waiting time is required for the preparation of this dish. The medium steak is served sliced for easy sharing and comes with a portion of thick red wine sauce and a portion of sarladise potato. To put it simply, sarladise means cooking it in fats (normally duck) and seasoned with garlic. The simple potato side dish is delightful as it absorbs the oil and it’s naturally flavoured by the fats and a tinge of garlic. For their steak, it’s a 10 out of 10 for it’s appearance. The appearance itself explains why 45 minutes of waiting time is required. The steak is properly sliced to the appropriate thickness so that it’s chunky but yet not overly thick. 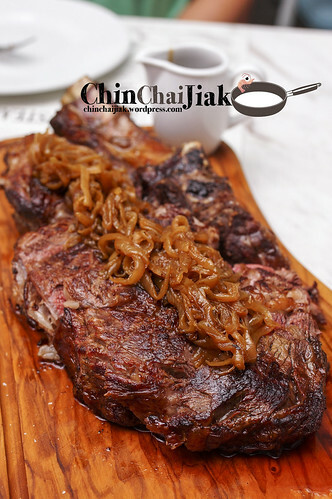 The exterior is grilled to slightly charred that adds on a grilled fragrance with a simple and yet well-balanced marinate of salt and pepper. The medium steak is tender in the juicy center. Certain areas of the steak consist of small chunks of fatty beef. Although it’s not exactly melt in your mouth, it’s definitely not rubbery and the fats break down with little effort from the jaw. 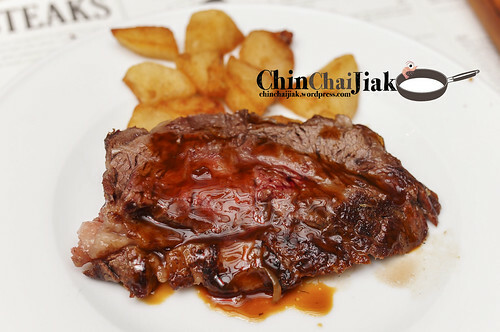 For more flavours, drizzle the thick red wine sauce over the sliced steak. For me, the steak itself is good enough. 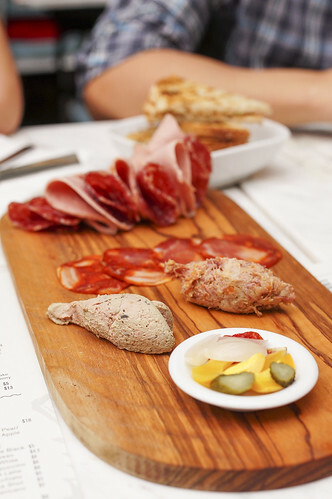 The outlook of this starter dish looks really sad, with a few piece of paper thin meat and slices of bread. However I will say that this starter is quite interesting but probably not something that Singaporeans will salivate over. The Pate Forestier, which is a chicken liver paste flavoured with garlic and mushroom. It taste very much like foie gras paste and it goes very well with the toasted sourdough bread. This is my favourite among all. Duck Rilette is like the shredded version of duck confit, salted and cooked in fats. 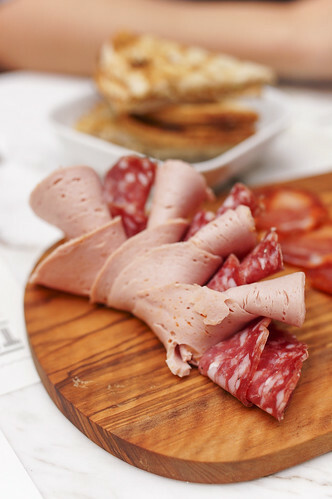 The Veal Lyoner (Lyon Sausage) taste very much like our cold cut ham. Nothing fantastic. The rosette superieure saucisson is a kind of thick, dry cured sausage that originates in France and there is a rather strong smell that is not exactly pleasant. Definitely not my favourite. I guess I am not very used to such kinds of flavour, but it’s really an eye opener. All these come at a price of $28. The onion matchsticks is actually onion rings. 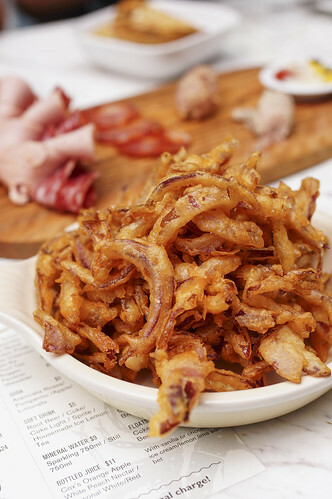 Sliced onions were coated in a thin batter and fried to crisp. It’s a little oily but really great to go with beer. By the way, have you hear of a saying that matchstick can help to prevent tearing while cutting onion? Bite a piece of matching stick with the head facing out and it will absorb the chemical that caused tearing. Probably it won’t work though. After reading this article from City Normads, claiming Market Grill to be the top 10 place for steak in Singapore, i decided to pay a visit. I’d researched on this place and the reviews are just so-so for the cheaper cut of steaks so i decided to try the premium range. It turns out to be a good decision after all. 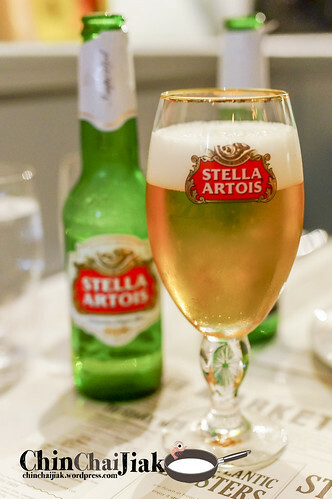 The non-overcrowding dimly listed restaurant/bar seems like a great place to chill out with friends after work while enjoying a reasonably-priced meal (they do not charge 10% of service charge). I didn’t have the chance to try their signature burgers so probably I’ll be back for those. For those who had their burgers, do feel free to share your experience with us. 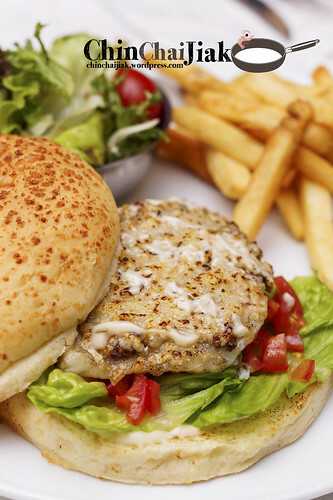 The supposed signature Cod Fish Burger. My friend said that it’s quite flavorful but a little salty. 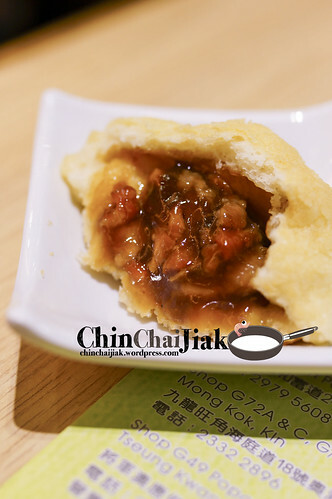 Tori King = 鸡王(Chicken King). 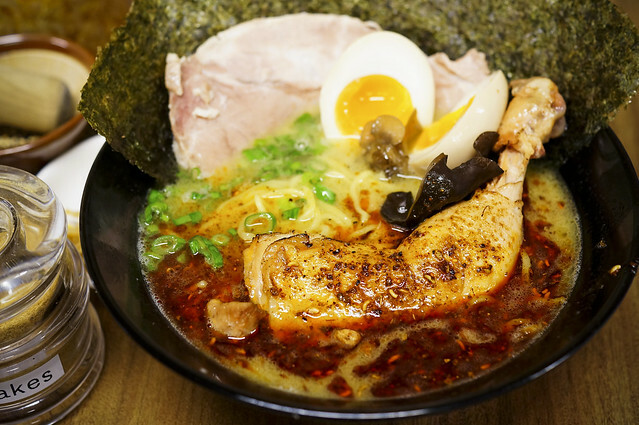 The founder, Keisuke Takeda, was once selected as the top ramen chef in Japan and crowned as Ramen King. 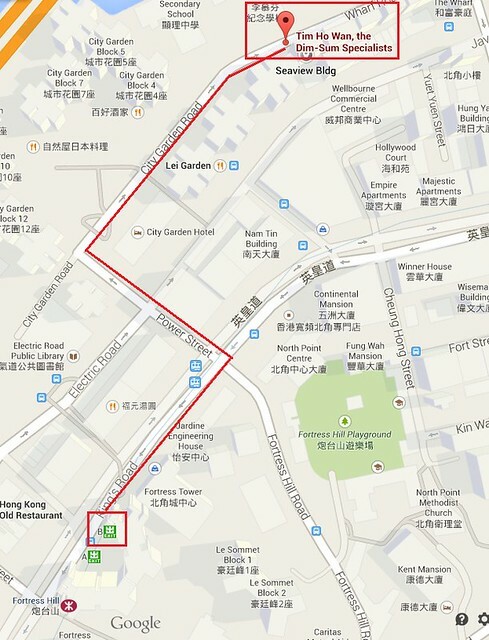 We can easily identify this place by the queue forming out the restaurant during dinner. No reservation is allowed so just be prepared to queue, especially during dinner time. 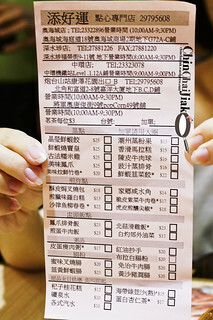 Like Ippudo ramen at Mandarin Gallery, seating priority will be give to those group with all members present. The menu is very simple. You got three kind of soup bases, the original, peppery black spicy, and green Spicy. 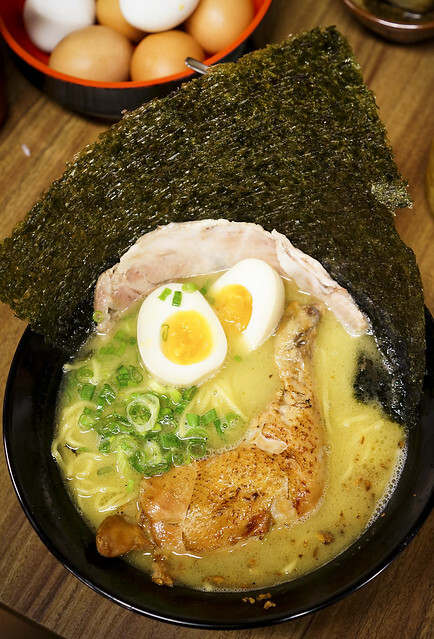 The ingredients for the ramen are the same for all the three soup bases. That’s right!! 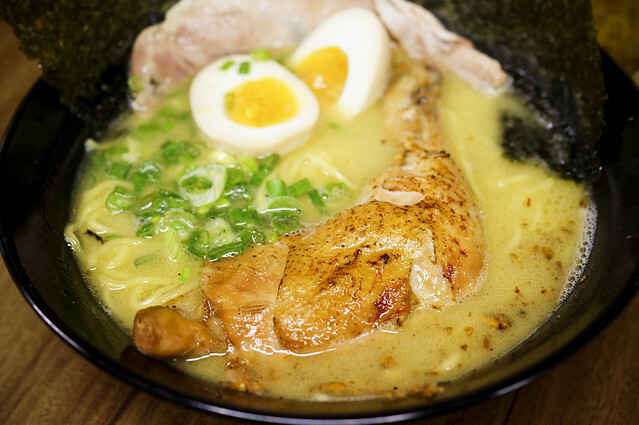 The secret to their great tasting ramen is definitely the chicken soup (鸡 白汤). 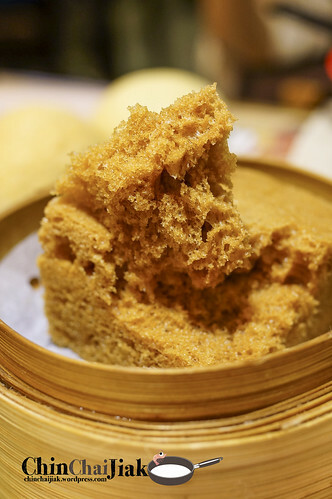 After waiting for about 30 minutes for my seat, the first thing that was served in Tori King was the mixed sesame bowl, for me to grind them into powder form, and probably to be added into the soup, or dip it with the chicken. Or maybe they just want to keep me busy while waiting for my ramen. 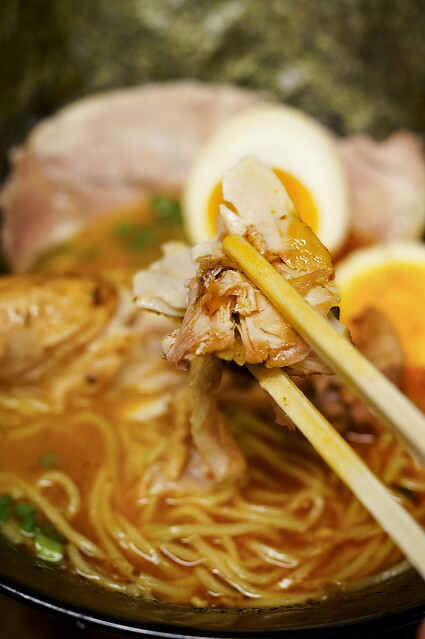 Tori King uses chicken broth unlike the majority, many traditional ramen places use pork broth. 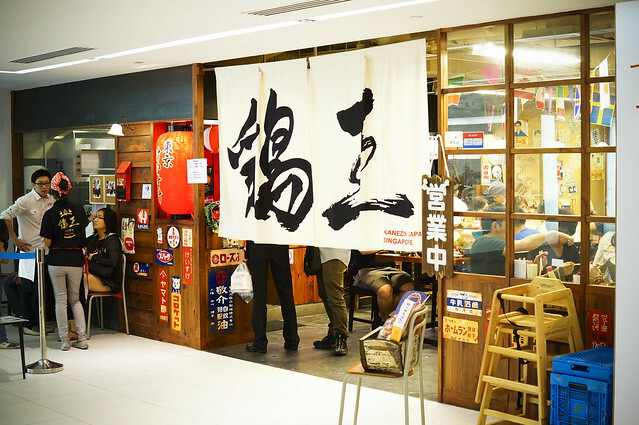 In comparison to Marutama ramen which also uses chicken broth, the taste of Tori King’s broth is stronger and much more flavorful. The stock is made from chicken bones, chicken feet, Japanese seaweed and an assortment of vegetables and boiled for eight hours. 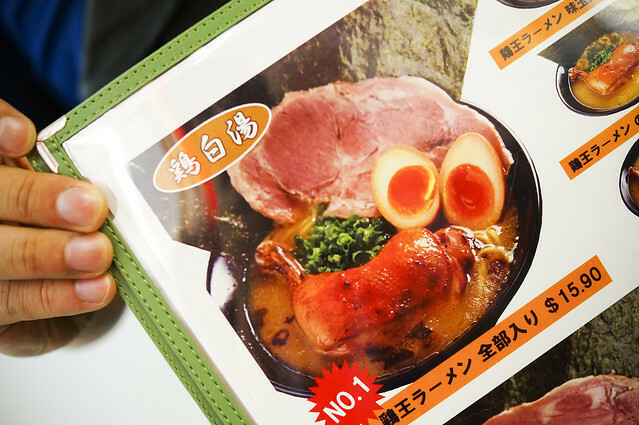 The original soup base comes with a piece of pork slice, giant seaweed, half boiled egg and the star of the show – the chicken drumstick! Chef Keisuke said the chicken is boiled for 45 minutes and submerged overnight in soy sauce and is grilled before it’s served. The chicken drumstick is so tender that the meat comes off the bone so easily. A pair of chop sticks is all you need. No fork and knife involved. The original broth with added black spicy garlic. I got to pay $1.00 more for this broth. I prefer this to the original. I like my ramen to be spicy. 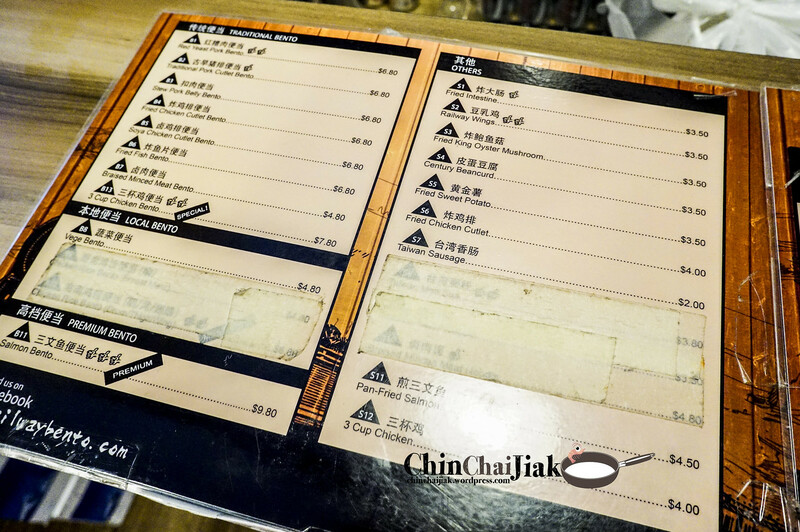 There are a lot of sauces at Tori King – There’s a glass jar containing chilli sauce which there is a written instruction on the wall mentioning that it goes well with the chicken. 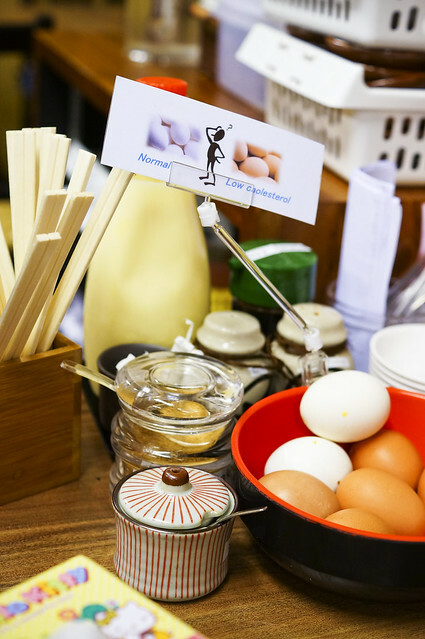 Like the Keisuke Tonkotsu King, there’s also free flow hard boiled egg, pepper and bondito flakes available. The mayonnaise goes pretty well with the chicken too, though i am not exactly sure that it’s the correct way of eating it. Remember to sprinkle some bonito flakes into your ramen soup! For those who prefers a blander kind of soup base, you may think that Tori King’s thick soup broth is a little too much to take. 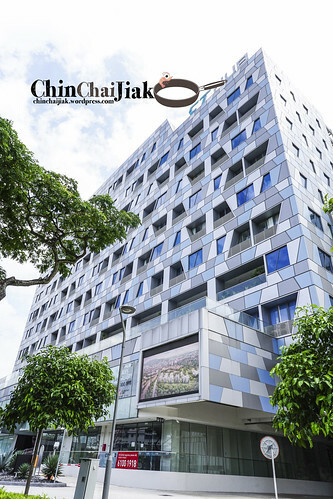 If you do not want to queue for too long, try to reach this place before 6.15pm and you should be able to get a seat for two quite readily. Did i mention that that i was quite a ramen fanatic previously when Standard Chartered Bank released a list of top 10 ramen in Singapore and i tired about seven or eight out of the ten, like Noodle Ken at Somerset, Ippudo at Orchard, Santouka and Marutama from Clarke Quay, Yoshimaru at East Coast, Mentei and Baikohken at Raffles Place etc. In my opinion, Tori King serves one of the best ramen that i ever had till date cuz the soup is awesome! And not forgetting the drum stick. Try it. Now.